Taking clear pictures of megaenzymes isn’t easy. But it’s definitely worth it. These proteins play an active role in creating many common antibiotics. They are in constant motion, with sections that flip around acrobatically to carry out necessary tasks. Now, for the first time, McGill researchers have been able to take a series of 3D images of a large section from one of these medicine-synthesizing enzymes in action. 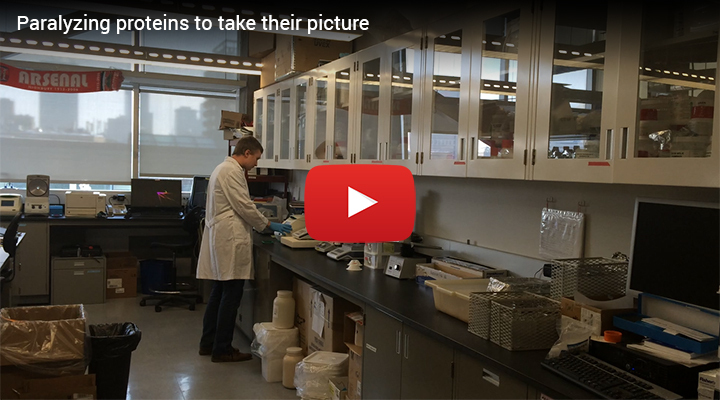 The researchers believe that the images they have generated will not only bring scientists closer to understanding how many antibiotics are made, but could, with further research, lead to the development of much needed next-generation antibiotics. ​This work was supported by CIHR grant 106615, a HFSP CDA and a Canada Research Chair in Macromolecular Machines to T. Martin Schmeing. Janice .M. Reimer is supported by an NSERC Alexander Graham Bell studentship, and Martin. N. Aloise by a studentship from the CIHR Training Grant in Chemical Biology.